Here are several photos showing some details of the assembly of a 3,000 cc Corvair engine in the shop over the last week. 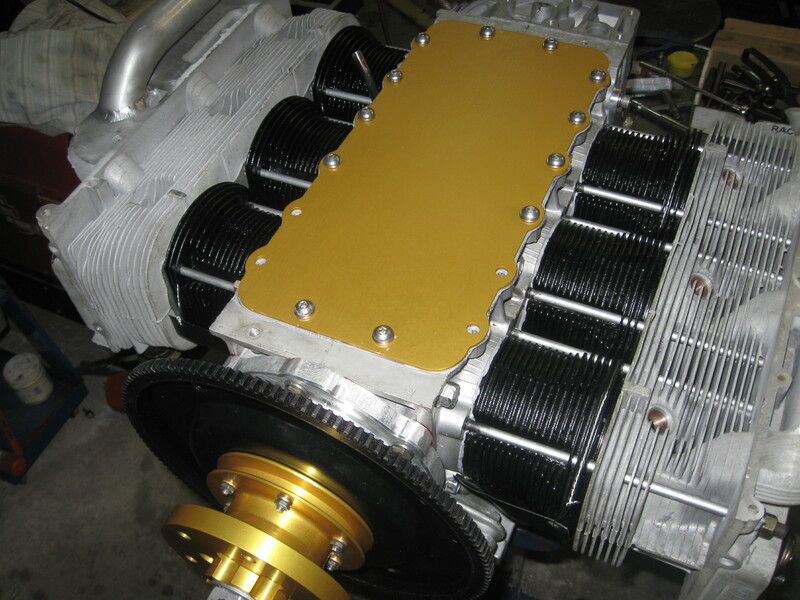 The engine is going to a Zenith 750 builder is Colorado. It is also the same engine shown running in the next story. Above, Rear quarter view of the engine. 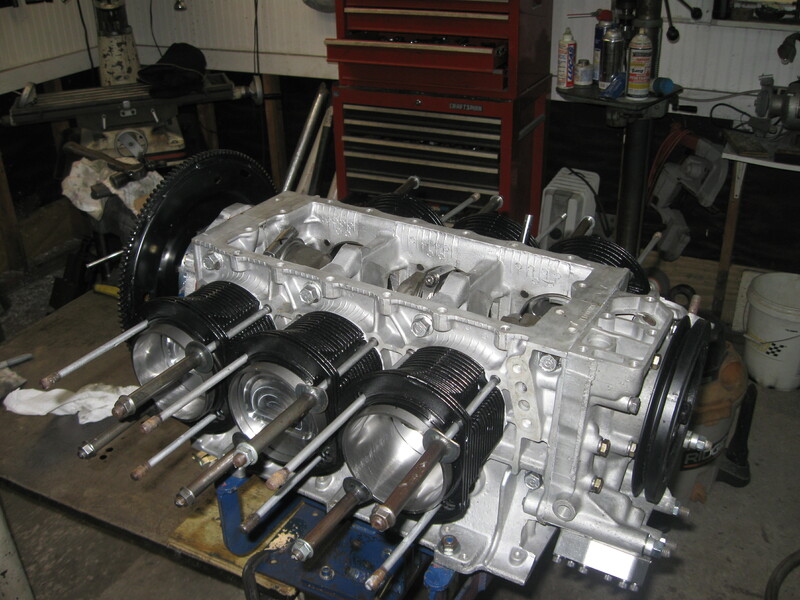 It is a 3,000 cc engine with a GM 8409 crank prepped by the Weseman’s with one of their Gen.II 5th bearings. 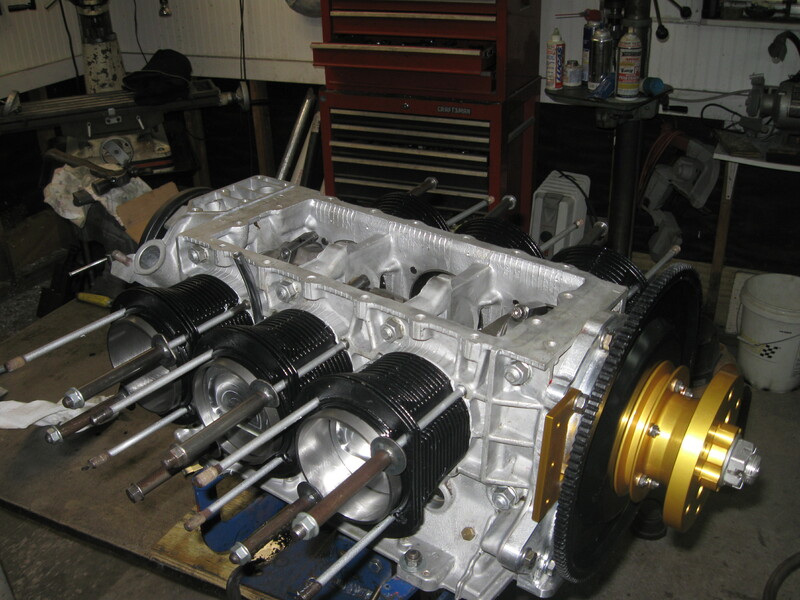 Visible in the photo is our #2000-HV rear oil cases, and the cylinders and pistons from a 3,000 cc Kit. When I assemble an engine it first starts laying on it’s side in a case stand, then I put it in a rotating stand (shown) and then I put it on a nose stand, and then it is transferred to the run stand. Building at home, you could start just with a stand and do the test run on your airframe. Everyone has an approach they like to use, but at the colleges I teach builder to mimic the four step process I do in the shop. There are faster ways, but the goal is not to get the motor done, it is to do an excellent job, understand what you are doing and do accurate work. I do not rush assembling engines, quick is not a goal. One of the things I have long noted is that if the engine is very firmly bolted to the bench, you can notice very small changes in rotating drag build up, etc. When working on things I like the part to be held firmly, the tools to be quality, and the lighting to be very good. To some people, just ‘having’ a plane is the goal, and building parts of it is some type of penitence. I also want the finished product, buy my goal is very different, the process matters to me. The destination is important, but I don’t try to get there by short cuts. I want to take the journey and enjoy it in style. As with most other things in life, people who obsessively want to find a short cut often find the longest and most expensive path, full of frustration, if they get there at all. On the studs are the cylinder hold down tubes that clamp each cylinder down as you assemble the motor. Without them, as you turned the crank to put each new cylinder on, it would dislodge the previous cylinders. Mine are steel, but even simple thick wall PVC will do the job. 3,000 cc motors do not use base gaskets. The cylinders are sealed with either Permatex Ultra grey #82194 or Loctite 515 #51531. You can find either of these at any auto parts store. Without fail, at every college, a number of builders will show up with chemicals, sealants and particularly Loctite products that are not the correct ones. Be advised: when I point this out, the wrong response is to say “This is the same stuff”. I have had at least 20 different things presented to me with the claim they are “the same” as Loctite 620. They are not. There is a very important lesson here. 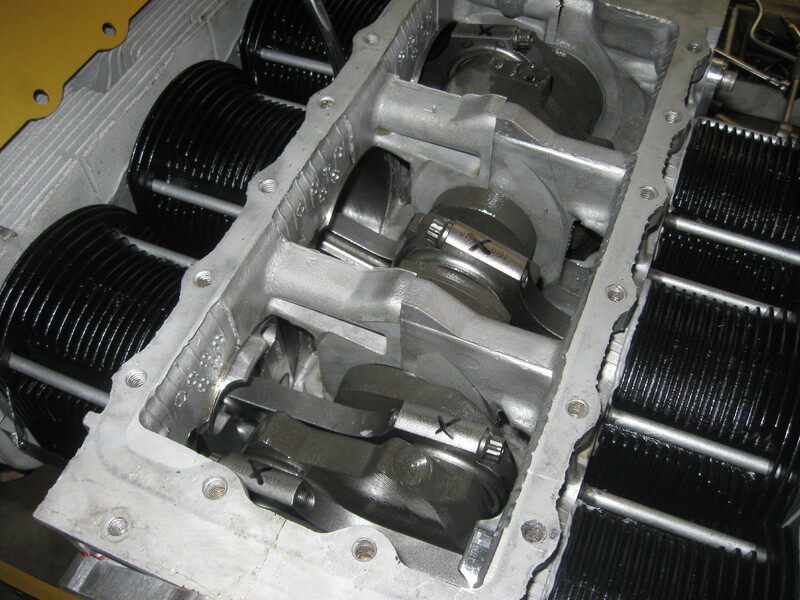 If someone is not willing to use the right material, they should not build any engine, not just a Corvair. If they don’t like following specific instructions, perhaps it is time to re-think even getting into aviation. “It’s is the same” is the indication that the person was unwilling to go to a second auto parts store 5 miles away to find the specified material. When I just drove 1,000 miles to get to the college, I am not sympathetic. This goes on with every part on the engine, including spark plugs. Please read this: A Tale of Two Spark Plugs…… “Guy A” in the story has a Phd in Aerospace engineering, 6,000 hours and has been an expert witness in trials that passed judgment on the mechanical decisions of others. You can be pretty smart, but success in aviation has more to do with paying attention to details, even if these details were developed by a long haired, foul mouthed, troglodyte aircraft mechanic in Florida with a two digit IQ. Above, a look at a perfectly rebuilt head. In our catalog and numbering system, heads are Group #1500. The individual numbers in the group run from #1501 to #1509, but a complete pair of heads comes with all the parts installed, ready to bolt on. These specific heads are from our Jacksonville FL. source that Dan and I have been working with for the last 6 months. It was a long developmental process to make sure that we can get the highest quality head work done, but we are there now. In the photo, these heads have “Timesert” spark plug inserts. Above, a look inside. Corvair Connecting rods are #1303 in our numbering system. Most of the engines we build have rebuilt GM connecting rods. However it is a popular option to use these billet rods from The Wesemans at SPA. You can read about them at this link: https://flywithspa.com/product/corvair-billet-connecting-rods/. The black X’s on the rods are my notes that they have been final torqued. Above, A top view. The Gold cover is part #2405. Note that 4 of the bolt holes are not filled. These are where the #2402 front starter brackets bolt up next. Under the cover is the #2406 gasket, which has a thin film of Permatex Ultra Grey on both sides of it. Like all our other parts it has directions that explain this. The directions are alo on our website products page. Lesson#2: When a builder at a College is installing the top cover, and coating it with something else, and I can see on his bench the instructions that came with his top cover still sealed in the bag on his bench, He is going to get a friendly but firm reminder from me that I hold colleges to teach people how to build Corvair correctly. I do not hold Colleges to help people get their engines done. Yes, that does happen, but it only happens when builders are doing it correctly and learning. If the instructions are in the bag on the bench that condition is not being met. 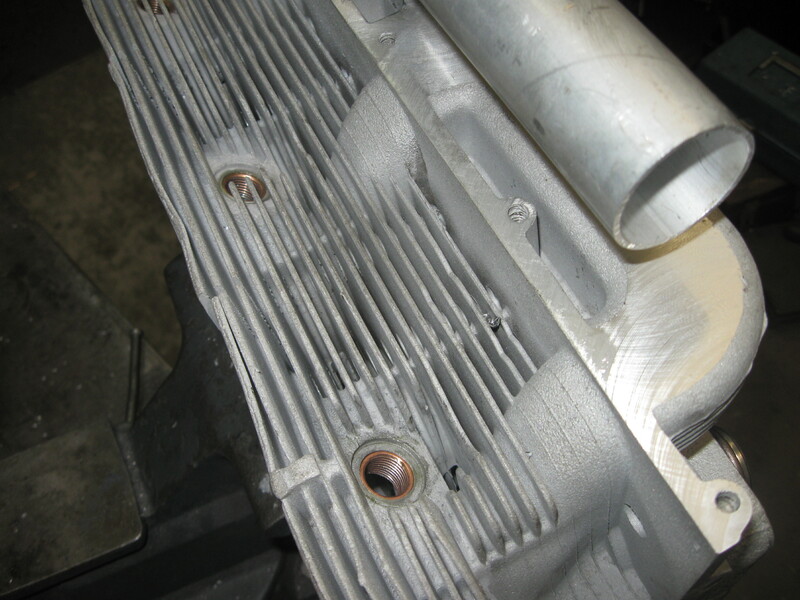 When even looking at pictures of engine, I can see details like what type of sealant was used on gaskets. It tells me a lot about what a builders mind set was when he was putting his engine together. I will occasionally remind people that I made the same amount of money selling a part that was installed wrong as I did selling the one that was installed perfectly. The only person who the guy in a rush cheated was himself. -ww. I’ve highlighted the one small change you might want to make in your post. It’s really minor, so it might not be worth doing. I didn’t spot any in your Night Engine Run post. I enjoy every one of your posts. Merry Christmas, and may both of you find your parents doing well. Great info on the 3L William. I’m enjoying flying my 2.7 but looking forward to getting the 3 L built and flying.